In this post, Camille Duran brainstorms concepts and scenarios to explain how technology and social media can help us re-establish the connection with our farmers – and why it economically makes sense. This blog post is a follow-up on Gerry Gillespie’s post published on June 20th 2013. It took me a while to realize the true potential of what Gerry was saying about re-establishing the relationship with our farmers. Probably because, like most of us, I easily gave up on the idea of knowing where our food comes from. I am not talking about reading the label that says “product of California” or “free range chicken”. I am talking about “Hey Jack, how was the yield last week?” or “We’ll take the kids to the farm this weekend if you’re around, they’d love to finally see the goats”. Take a minute to think about this. Would this change your relationship with your food and the food system? It would definitely change mine! 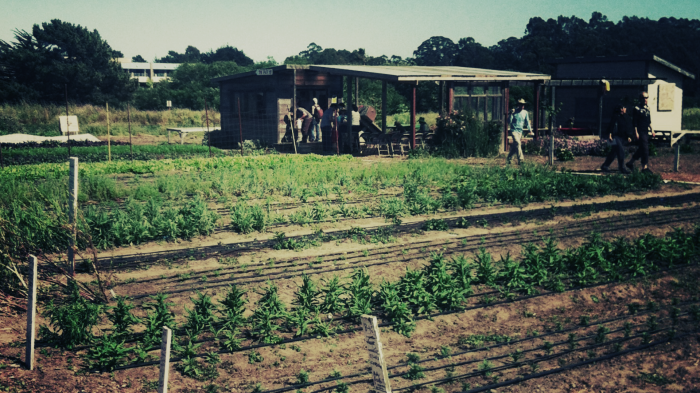 Community Supported Agriculture – A solid platform to build upon. • CSA is supportive of small farms and helps smaller producers market themselves and stay competitive. CSA’s marketing is usually minimal and outreach strategies are mostly based on word-of-mouth and direct marketing, like at the farmer’s market for example (brochures, stands…). Yes, word-of-mouth is the most efficient of all marketing techniques, especially for alternative products or services. We trust our friends and family more than the TV or radio ads. That’s a fact. But word-of-mouth has fundamentally changed in the last 5 years, because of social media. Social media brings scale to word-of mouth. 10 years ago you could tell only a few persons at the time about a product or service you loved. Today you can tell hundreds, thousands, some of us can tell millions of people at once, in a few seconds only. We now live in a hyper-connected world where one person or organization can engage in a real-time discussion with many, from pretty much anywhere, using a device called “a smartphone”. Big CSAs can serve up to 500 families. That’s 500 relationships. 500 daily/weekly/monthly conversations. Nothing unusual in the social media space. Getting farms on social media platforms is for me the only way to re-establish true consumer-farmer relationship considering that we need to play with scale constraints. In the food system of the future, the farmer is at the center of the discussion, and plays an instrumental role on social media platforms. He is the profile all consumers “follow”. CSAs are an interesting platform to build upon because they have successfully designed a model where farms occupy a central component in the chain and have developed a customer base which cares about food. Let’s create a social media platform dedicated to your food system. You go shopping. On every product that you buy, you scan a bar code (or QR code) with your smartphone. Scanning the code takes you directly to the producer’s profile page on this social media platform. You ”add” the producer to your profile page like you add a friend on Facebook. You will now see all updates from this producer and will be able to engage, share feedback, and build a relationship with the farm staff. Because farmers will understand that it’s a unique way to market their product and build relationships with consumers, they will invest time in nurturing relationships (sharing news, getting to know you, posting recipes, promoting events at the farm…). Gerry, here is our connection to the farming family! Why will we care about this food system more than we care about the current one? Because human beings have a profound passion for stories. And this model is all about storytelling. What better décor than the farm to tell a story? Animals, produce, yield, weather … Farmers will often have many tales to share and would be delighted to use them as a marketing tool. That’s what they are already doing at the farmer’s market by the way. Large food companies are trying all they can to trigger the “trust” component of their brand. They do understand storytelling and to some extent succeed in creating a feeling of authentic connection to the farms (this Tropicana TV commercial is a good example). However, the fact that they are fighting against lawsuits on the side constantly reminds consumers that our food system is broken and that the guy in the commercial is probably an actor. Storytelling and customer development are perfect battles to take against industry giants as our farmers will always win; they are the advocates of transparency and sustainable production. This translates in a unique opportunity for the sustainable farming family to increase market share, as marketing efforts will essentially take place on social networks in the coming years. Social media efforts at the farm will rapidly pay for themselves. Online relationships are similar to in-person relationships in that “authentic always wins”.